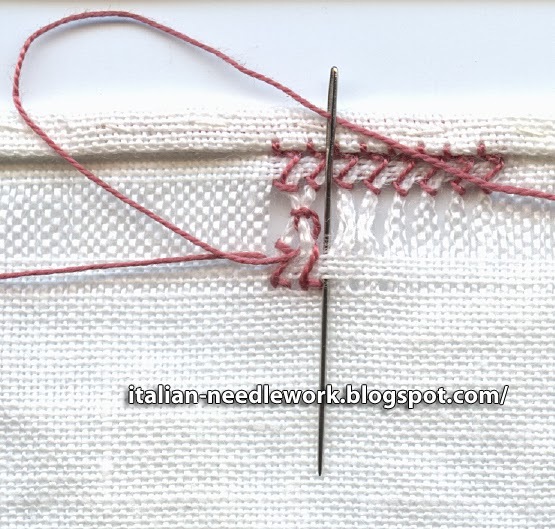 A reader very kindly reminded me that I had never posted the second part of this post on finishing a hem with Gigliuccio hemstitching (Peahole hemstitch) executed on the back side of the fabric. So, without further ado, here is how to do it. 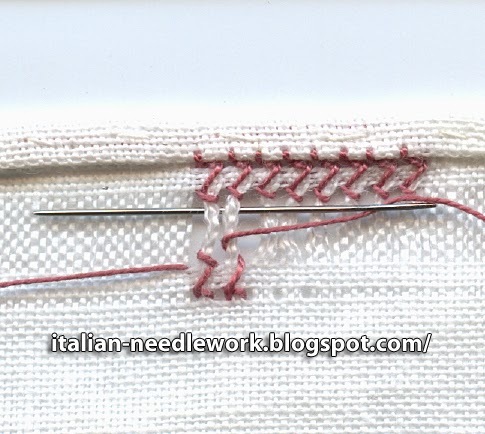 You need to execute this on the back side of the work because the four-sided stitching will match that of the series of stitches you have done to secure the hem. 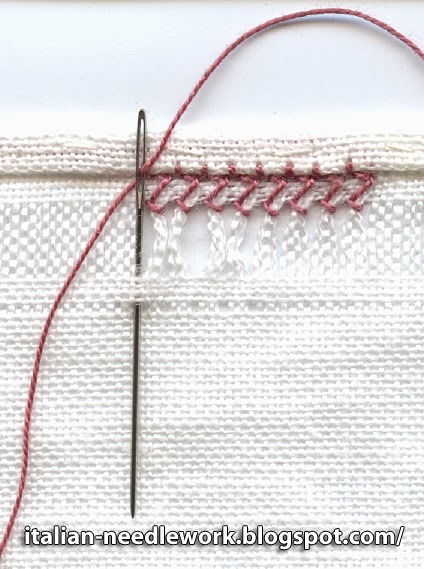 This step today will be knotting the bundles together to create the characteristic look of this lovely hemstitch. 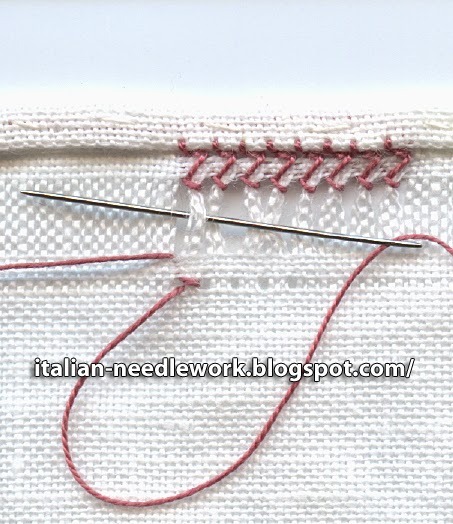 Assuming that we are carrying on after having secured the hem as we did here, turn the work so that the already executed hem is at the top and work from left to right on the back side of the work. 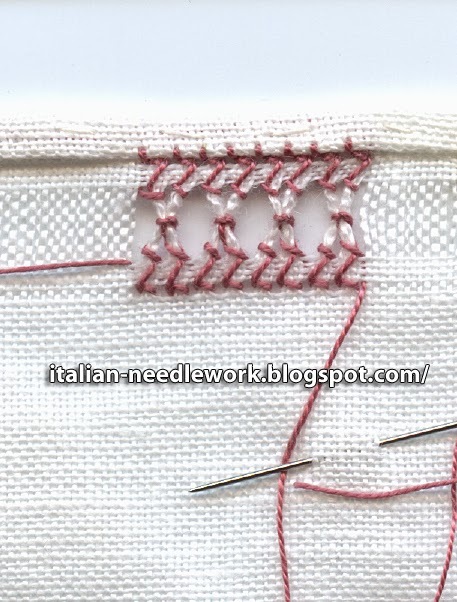 If you do this in tone-on-tone you will not see the criss-cross of threads. 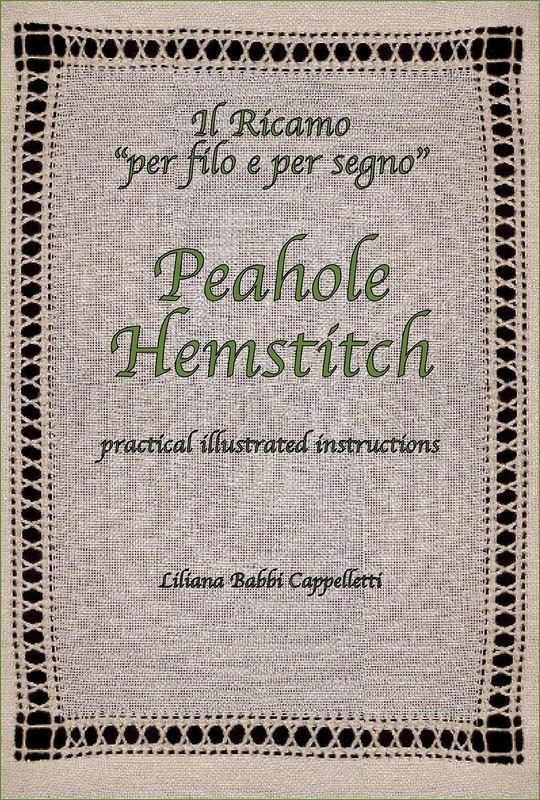 There is a great in-depth booklet on this and many other little tips and tricks for executing the Gigliuccio Hemstitch in a variety of ways which can be had by contacting the author, Liliana Babbi Cappelletti. Be sure to ask for the English version if that's what you need. 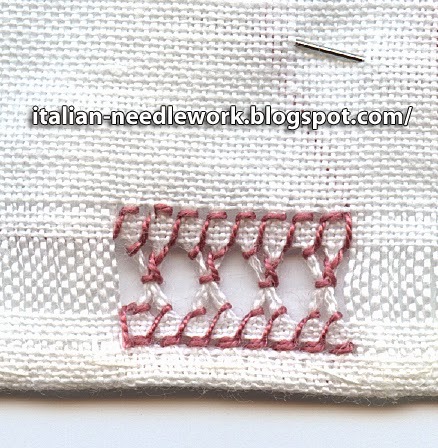 To see how to do the Gigliuccio hemstitch on the right side of the work, check out this post here. 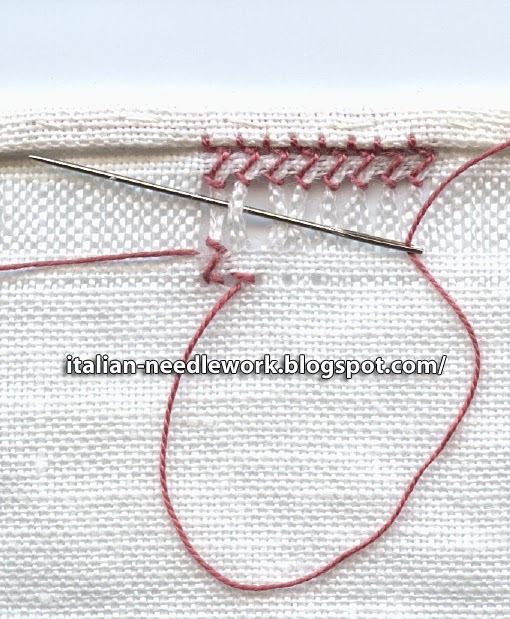 In Italy Art Nouveau style is called Liberty after the British company Liberty of London. 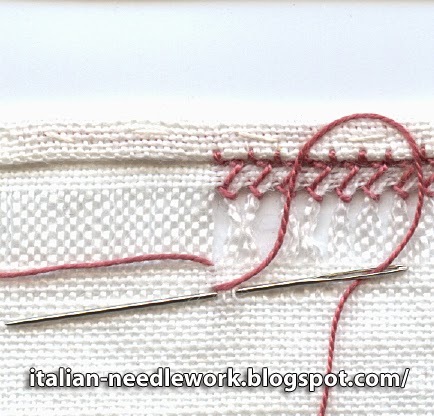 Art Nouveau style was influencing all forms of creativity during the time that Aemilia Ars needle lace was born which is apparent in early pieces of this beautiful needlework. 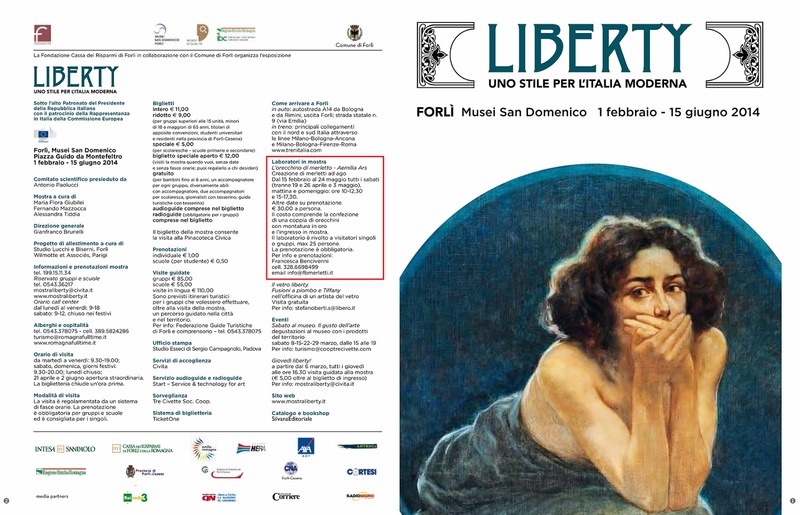 From February 1st until June 15th, 2014 there is a Liberty exhibition held at the San Domenico Museums in Piazza Guido da Montefeltro in Forlì, Italy. 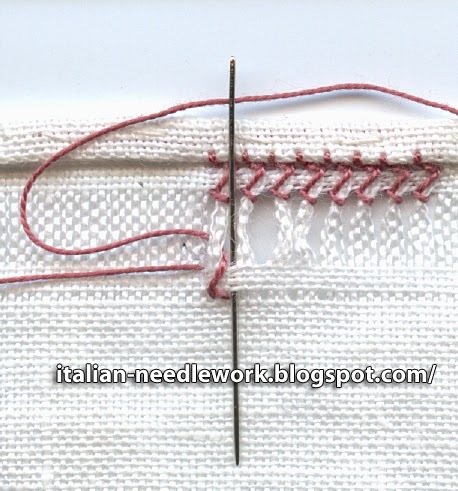 Also featured in the Liberty exhibit at Forlì will be the Aemilia Ars needle lace altar cloth masterpiece created by the lacemakers and embroiderers of the Sanctuary of the Sacred Heart of Jesus of Bologna in the early years of the 20th century. 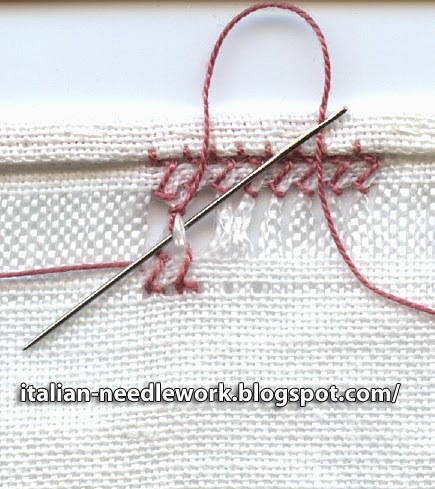 I wrote an article for Piecework magazine about this altar cloth which I had the extreme privilege to view while on display at Easter at the Sacred Heart in Bologna in 2011. There are some photos of it here. 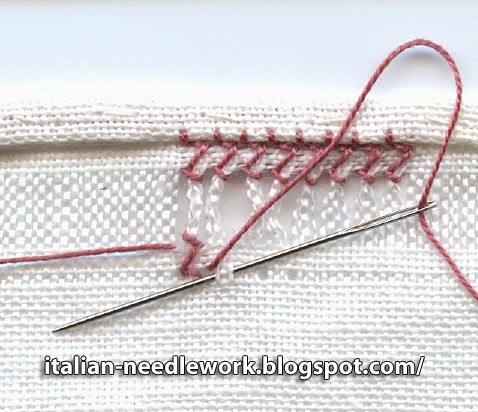 In this post here, I told you about two table cloths created by the Aemilia Ars Society in the early part of the 20th century. I have as yet been unable to discover if either of these incredible pieces have survived to present day. Inspired by the beauty of these designs Francesca Bencivenni of Bologna has created her own masterpiece which will be on display as well at the Liberty exhibit in Forlì. 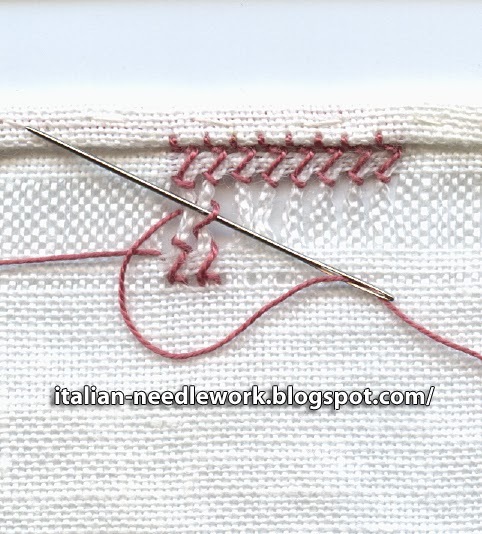 Francesca's peacock Aemilia Ars needle lace measures 89 centimetres long and 21 centimetres high and took more than 1100 hours for her to complete. It will be for sale at the end of the show - best offer will take it home - interested parties should contact her directly at her contact info on the brochure pictured above. I am in no way involved with, nor will I benefit from, the sale of the lace. If I could buy it myself I would have already made an offer! If you find yourself in Italy this spring, make the effort to get to this show. I know I always say this but I really do wish I were able to get to this exhibit! If you go, please let me know how it was!